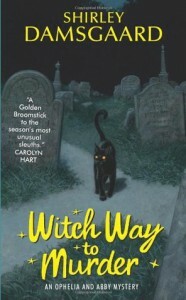 Witch Way to Murder - Shirley Damsgaard - review - What is Kimberly reading now? I would have been more into this if Ophelia hadn't been in such need of an attitude adjustment. She was so closed minded about just anything and everything. Granted Rick was being a persistent pain in the rear with all the questions and just not taking no for an answer. Even I was starting to side with Ophelia in regards to Rick and wanted to smack him for her. Basically, by the end of the book I think he just wore her out and pulled a punk move by leaving town. Anyway, enough of those two. The mystery part was okay up until the end when we find out who did it and come to find out that the killers were a bunch of idiots to begin with. Seriously, do people not watch James Bond movies and learn from them that as a bad guy, you shouldn't give a speech about how you killed and are going to kill again because that gives the people you are trying to kill a chance to get away? Come on now! I will say that Darci was the best part of the book. Once Ophelia let her guard down and let Darci be a friend, the story was more upbeat.